An infrared image reveals strange bright streaks extending from Santa Fe crater on Mars. Researchers suggest the streaks were caused by tornado-force winds created by the impact that formed the crater. When we look at ancient impact craters on Mars, one bizarre feature stands out: enormous, outward-going streaks. Pairs of images illustrate how Martian crater rays appear in different wavelengths of light. The left hand images are THEMIS nighttime thermal infrared images, while the right are visible light images from Mars Global Surveyor. These aren’t visible during the day, but appear at night in the infrared, as bright streaks hold onto excessive heat. On Mars, bare-rock structures hold onto heat far better than sand-like structures do, meaning they will appear brighter at night, when viewed in the infrared. To retain heat, the streaks must be made of bare, blocky structures that somehow had all the sand and dust stripped from them. Sand and briny liquids can flow along the surface of Mars, but while they may explain some phenomena (like the recurring slope lineae shown here), they cannot explain these distant crater rays. “That tells us that something came along and scoured those surfaces bare,” says Peter Schultz, lead author on the new study. What could be that thing that came along? Barreling, sideways tornadoes. Tornadoes are bigger and more powerful on Mars than they are on Earth; this one imaged by the Spirit Rover in 2005 is three separate images taken 2 seconds apart apiece. Many craters on worlds contain streaked, scarring pattern headed radially outward from a crater, but the ones on Mars are different. A detailed, infrared view of a crater on Mars at night reveals these distant, outward streaks that hold onto heat better than all the surrounding areas. Scientists believe rolling tornadoes are the core explanation. For the craters’ sizes and the energy that created them, the streaks — only visible in the infrared — extend out much too far. Streaks arising from newly formed craters on Mars (shown in enhanced color, here) can extend for miles, but the infrared streaks of the earlier craters shown are far larger in extent. This isn’t normal ejecta, but an additional phenomenon, which is where the barreling tornadoes idea fits in. Winds at speeds up to 100 km/hr travel across the martian surface. 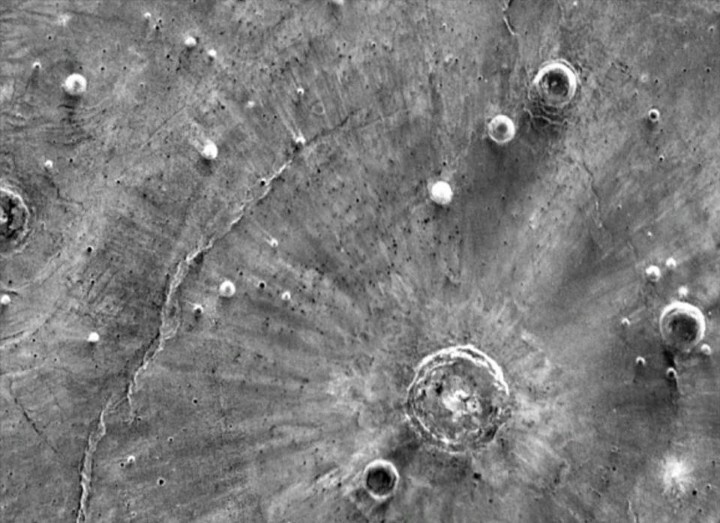 The craters in this image, caused by impacts in Mars’ past, all show different degrees of erosion. Some still have defined outer rims and clear features within them, while others are much smoother and featureless, almost seeming to run into one another or merge with their surroundings. High-velocity impacts can cause high-speed vortices to form and travel just over the surface. NASA’s Mars Reconnaissance Orbiter has captured images of dust devils, analogous to tornadoes, more than 10 miles high on the red planet’s surface. Martian orbiters have already seen normal tornadoes form on the red planet’s surface. hese experiments at the Ames Vertical Gun Range helps researchers understand how surfaces and vapor plumes respond when struck by both hollow and solid impactors at high speeds. These impacts formed vapor plumes, which travel at supersonic speeds. The streaks are often associated with smaller craters that were in place when the larger crater was formed. The raised ridges of the preexisting craters disturb the flow of the vapor plume, which causes vortices to form and scour the ground.